The company founded in 1968, at the behest of the brothers Francesco and Mario D'Amico, is now in its third generation. D & D Italia is one of the leading companies in Italy specialized in the production of preserved food. Present on the market with D'Amico, Logrò and Montello brands. The activity began first with the production of the "Anchovies of the Amalfi Coast" specialty, but since the early 70s they were also present in the market of vegetables, mushrooms and olives, developing over time a wide range. Today the core business is represented by the markets of : Sottoli, Sottaceti, Olives, Condiment for Rice, Ready Sauces, Pestos and Creams, Legumes and Cereals; conventional and organic. Over the years D'Amico has distinguished itself for high quality standards in processes and services with a production carried out in the modern plants of Pontecagnano Faiano and Rovereto, careful selection of raw materials, constant search for new products and innovative processing methods, technologically advanced production systems, assistance and dedication to customers. 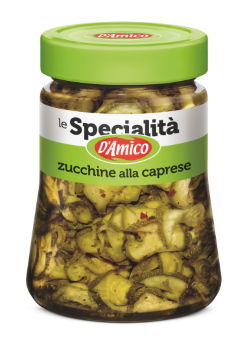 D’Amico products are exported to: Europe, Canada, Russia, United Arab Emirates, Mexico, Australia and China. D'Amico, synonym of Italian guarantee, in the world.